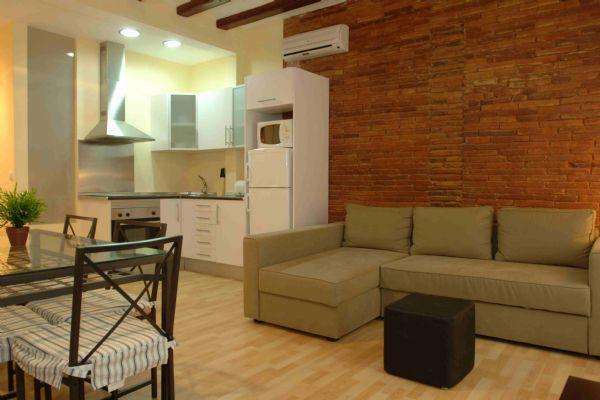 This modern and stylish, two-bedroom Barcelona apartment has recently been renovated. It is situated in a fabulous location, close to the famous Las Ramblas and many more of Barcelona´s most popular attractions. Although it has been completely restored, it keeps many of its original characteristics, like the open-faced brick walls and ceiling beams. Accommodating up to six people, it is a great choice for a family or group of friends visiting the city. It is composed of one bedroom with two single beds (which can be made into a double bed) and plenty of storage space, and one bedroom with a bunk bed (two single beds). The living room is light with large windows that lead onto two balconies, and it is equipped with a double sofa bed and a dining table. There is also a TV, and a Wi-Fi connection, allowing you to stay in touch with friends and family at home. The fully equipped, American style kitchen has an oven, microwave, kettle and much more. There is also a washing machine and iron for your convenience. The modern and well-lit bathroom has a walk-in shower. This charming apartment also has heating and air-conditioning providing you with a fantastic choice of Barcelona accommodation at any time of year. Please note that this apartment is for families and clients over 30 years old. El Barri Gòtic, also known as the ´Gothic Quarter´ is located in the heart of Barcelona and is the oldest town in the city as this neighbourhood was once the first part of the original Barcino, the ancient Roman city of Barcelona from which the Catalan capital we know today, developed. El Barri Gòtic is situated in-between the famous Las Ramblas and the grand Via Laietana, and its boundaries stretch all the way to the Mediterranean coast. The area is characterised by winding, labyrinthine streets, intimate plazas, public spaces, and beautiful Gothic architecture. In the Barri Gòtic you will find the famous Barcelona Cathedral, as well as the political and public heart of Barcelona, the Plaça de Sant Jaume, where the Generalitat de Catalunya and the City Council operate. El Barri Gòtic is the perfect place to get an authentic feel for the rich history of Barcelona, as well as enjoy some of its famous contemporary attractions. Starting from Plaça de Catalunya, a walk down the commercial street, Portal del Àngel, will take you to plenty of well known shops and authentic cafés. Strolling along the narrow, twisting streets of El Gótico, you will come across many unique boutiques, ideal for picking up some souvenirs, plus plenty of restaurants and bars with terraces where you can relax and take in the beautiful surroundings. In the picturesque Plaça Reial, there are many great places to dine as well as some top nightclubs. If you´re looking to make the most of your stay in Barcelona and want to be close to some of the city´s most historic sights, then opting for an apartment in the Gothic Quarter is the perfect choice.